This is the text of the bill introduced in the U.S. Senate on March 14, 2019 by Senators John Cornyn (R-TX), Tammy Baldwin (D-WI), Mike Crapo (R-ID) and Sherrod Brown (D-OH) banning the use of federal funds for the purchase of mass transit rolling stock from manufacturers owned by Chinese-based companies (and withholding federal transit funds from agencies that use their own money to purchase such rolling stock). This is a "Dear Colleague" letter from Rep. Nita Lowey (D-NY). chairwoman of the House Appropriations Committee, dated February 28, 2019 (but not released until the following day). It notifies House members that she does not expect fiscal year 2020 appropriations bills produced by her committee to contain earmarks. This is a letter marked "CONFIDENTIAL" from Treasury Secretary Ogden L. Mills to Acting House Ways and Means chairman Charles L. Crisp dated February 16, 1932 recommending that Congress enact a new excise tax on gasoline to help eliminate the projected federal deficit. This PDF is a series of documents relating to a proposed amendment in the House Ways and Means Committee to the revenue title of the highway bill in 1978. Drafted (at the Department of Transportation's request) by Reps. Barber Conable (R-NY) and Sam Gibbons (D-FL), the amendment would have put the Highway Trust Fund on a form of "accrual accounting" and ensured that each year's new funding authorizations were reduced to that upcoming year's estimated excise tax revenues. This is the enrolled bill file prepared by the Bureau of the Budget on the Federal Aviation Act of 1958. The file contains a summary of the bill prepared by BoB and letters from all relevant federal agencies expressing their opinions on whether or not President Eisenhower should sign the bill into law. He did sign it into law, on August 23, 1958, creating an independent Federal Aviation Agency. This is a February 1942 analysis by the Treasury Department's Office of Tax Analysis of the pros and cons of a variety of potential excise tax increases on gasoline, fuel oil, lubricating oil, and other petroleum products. The analysis weighs the need for extra federal revenue to fight the war against the need to conserve petroleum, rubber, and other war materiel and how taxes dovetailed with the rationing of those products. This is a May 16, 1933 letter to the U.S. Treasury Secretary from the head of the Farm Products Chemical Company of America (and its lawyers/lobbyists) advocating federal legislation to levy an additional surtax on gasoline unless that gasoline includes a minimum percentage of ethanol that would quickly rise to 10 percent of the total. 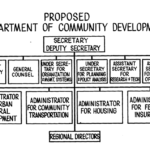 This is the full justification document for President Nixon's 1971 proposal to create a new Cabinet-level Department of Community Development which would have contained all of the previous Department of Housing and Urban Development, plus the Federal Highway Administration, the Urban Mass Transit Administration, the highway safety grant program of the National Highway Traffic Safety Administration, the rural development programs of the Agriculture Department, and sundry other programs and agencies. This is a PDF compilation of 55 original documents relating to the decision in 1968 to move federal responsibility for urban mass transportation from the Department of Housing and Urban Development to the Department of Transportation. 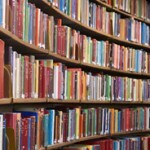 This is a document called "User Charges: Panacea or Pitfall?" produced by the Aircraft Owners and Pilots Association (AOPA) in 1969 to provide policy justification for their opposition to the concept of having to pay user charges or user taxes for air traffic control services. This is a PDF document containing numerous tables relating to the fiscal year 2017 TIGER grants released by the U.S. Department of Transportation on March 9, 2018. Memorandum of understanding between Congressional leaders on the bipartisan budget framework to complete fiscal 2018 appropriations and allow fiscal 2019 appropriations. This is a 6-page summary of a much longer draft outline of President Trump's infrastructure plan prepared by the National Economic Council. The document is not dated but the metadata in the PDF suggests it was converted from MS Word to PDF format on January 8, 2018. This is a PDF copy of the report that the Federal Railroad Administration was required to submit to Congress by section 11406 of the FAST Act. It evaluates every railroad's compliance with FRA safety advisories relating to overspeed through curves and also gives a good summary of the FRA response to the fatal 2013 Metro North and Amtrak Philadelphia derailments. The report was submitted to Congress in May 2016 and does not cover any new service that began after that date. This PDF contains documents from the Eisenhower Library relating to the Cabinet meeting held September 30, 1955. 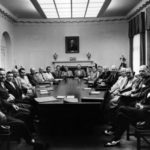 This was a very unusual Cabinet meeting in that it occurred six days after President Eisenhower had a massive heart attack while on vacation in Denver, Colorado. This PDF file contains a July 15, 1977 memo from Transportation Secretary Brock Adams to President Carter saying that "the transportation and energy problems cannot be pulled apart. Responsible sentiment is rising for a marriage of these two problems, and the argument is helped along by the realities of Congressional action." 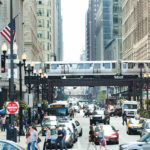 Adams proposed increased energy taxes (either an oil well-head tax or an increase in the gasoline tax) to remove the need for general revenues to be used to pay for mass transit and railroad programs. Memo from Transportation Secretary Rodney Slater to President Clinton dated February 24, 1997 where Slater requests that the President approve the draft NEXTEA surface transportation reauthorization bill authored by DOT and transmit the bill to Congress as Administration policy. Documents relating to President Johnson's June 1967 order consolidating federal highway safety functions and federal motor vehicle safety functions into one entity, which is now NHTSA. This is a PDF of the "memo for the record" by General John Stewart Bragdon, President Eisenhower's public works advisor on the White House staff, recounting a meeting held on December 13, 1954 in which General Lucius Clay and the other members of the Clay Committee briefed White House staff and leaders of other government agencies on the outline of the Clay Committee's forthcoming report. This is a May 4, 1954 letter from New York City planning czar Robert Moses and New York State Public Works Commissioner (and future Federal Highway Administrator) Bertram Tallamy to President Eisenhower's Chief of Staff, Sherman Adams. The letter forwards Adams the Moses-Tallamy proposal for a $15 billion program to build continental toll highways, which the letter said had been discussed in Adams' office earlier that year. This is the final report of the Task Force on Transportation of the first Hoover Commission, dated October 15, 1948. 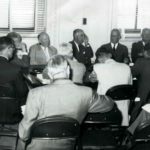 Draft Reorganization Plan from the Truman Administration creating a Federal Transportation Agency to include all functions currently exercised by the Public Roads Administration, the Coast Guard, the Civil Aeronautics Administration, the Civil Aeronautics Board, the U.S. Maritime Commission, and the Weather Bureau. This is the full civil engineering study from the 1959 Mass Transportation Survey of the National Capital Region, the first official federal study to recommend the creation of a mass transit system in the Washington DC area. Memo presented to President Reagan on November 17, 1986, expressing the views of the Administration on the enrolled bill H.R. 6, the Water Resources Development Act of 1986. Memo to President Johnson from the Bureau of the Budget on H.R. 15963 (89th Congress), the Department of Transportation Act, summarizing the legislation and recommending signature. The memo is accompanied by letters from various federal agencies expressing their views on the enrolled bill as well as a three-page summary of the major differences between the President's original proposal and the enrolled bill. President Ford's Decision Memo Naming the First Space Shuttle Orbiter the "Enterprise"
This PDF file is a series of memos relating to President Gerald Ford's decision on September 8, 1976 to name the first Space Shuttle Orbiter the "Enterprise." This is a PDF compilation of memos from the LBJ Library relating to the House of Representatives' consideration of the bill creating a new U.S. Department of Transportation. Internal White House memorandum dated November 17, 1955 summarizing a "Road Gang" luncheon panel discussion on what the outcome for the highway bill would be in the upcoming 1956 session of Congress. This is a collection of memos to President Eisenhower discussing whether or not he should sign into law the 1958 highway bill. November 1956 proposal from White House public works planning advisor John Bragdon for a comprehensive system of federal grants to state and local government to encourage long-range public works planning and the creation of what are now called MPOs. This is a draft proposal to create a U.S. Department of Transportation from fall 1959, under the Eisenhower Administration. A September 1916 pamphlet containing the text of the Federal Aid Road Act of 1916, a summary thereof, the text of implementing regulations, and an article by the Secretary of Agriculture explaining the need for the program. Report of the committee of conference to accompany the bill H.R. 7617 (64th Congress), the Good Roads Act. Transcript of the subcommittee markup session of H.R. 13200 (the Department of Transportation Act proposed by the Johnson Administration) held by a subcommittee of the House Government Operations Committee on June 22, 1966, at which the subcommittee ordered the bill favorably reported with amendments. This PDF file contains White House memo traffic from April and May 1975 regarding the Ford Administration's decision to use accelerated Interstate transfer payments to bail out the WMATA Washington Metrorail construction project. PDF file containing three memos relating to the Johnson Administration's quest for more transportation user charges, from May 1966. Records of the April 1, 1966 Cabinet meeting convened by President Johnson to discuss the need to reduce federal expenditures to fight inflation. At the meeting, Johnson ordered all federal agencies to try to find ways to cut federal expenditures (outlays) for construction-related activites for the upcoming year by 10 percent. This was the root of the highway spending impoundments that would plague the highway program from fall 1966 through spring 1975 and which shaped the debate over the Highway Trust Fund for decades after that. Text of the George H.W. Bush Administration's proposed Surface Transportation Authorization Act of 1991, as introduced in the House of Representatives as H.R. 1351. The bill proposed the creation of a 150,000-mile National Highway System and provided some of the foundation for the eventual ISTEA law later that year. Message from President Johnson to Congress on March 2, 1966 that recommended the following: creation of a new Department of Transportation, the establishment of a new federal program of highway and vehicle safety, and the strengthening of the President's power over the Interstate Commerce Commission. January 28, 1966 memo to President Johnson from White House aides Joseph Califano, Jr. and Lee White recommending specific components of a new Department of Transportation and asking the President to side with them on disputes over treatment of the Coast Guard and Civil Aeronautics Board. LBJ hand-wrote at the end of the memo "I don't know enough - can't you reconcile difference before I act - L". This is a January 10, 1966 "Eyes-Only" memo from Under Secretary of Commerce for Transportation Alan S. Boyd to White House domestic policy czar Joseph Califano, Jr. The Boyd memo is a direct response to a December 20, 1965 "Confidential" memo from Federal Aviation Administrator Charles "Bozo" McKee objecting to many specifics of the pending plan to create a new Department of Transportation (though it is not clear that Boyd knew that the unsigned December 20 paper was from McKee). Whenever the Boyd memo says "attached paper" it is referring to the December 20 McKee memo. A January 2, 1976 memo from OMB Director James Lynn and Transportation Secretary William Coleman to President Ford asking the President to decide what positions to take in final negotiations with House and Senate conferees on the pending omnibus railroad bill (S. 2718) and a follow-up memo on January 6 from White House staff to Lynn listing and explaining the President's decisions. The final bill became the Railroad Revitalization and Regulatory Reform Act of 1976 (Public Law 94-210). December 20, 1965 confidential memo from FAA Administrator William F. "Bozo" McKee in opposition to the creation of a Department of Transportation. Collection of internal White House and Bureau of the Budget memos from October 1970 on whether or not the President should sign or veto H.R. 17849, the Rail Passenger Services Act, which created Amtrak. Set of memos sent to White House domestic policy chief Joseph Califano on November 24, 1965 giving the Bureau of the Budget's opinions on the three parts of the FY 1966 legislative agenda for transportation proposed by the Interagency Task Force on Transportation. The three parts of the agenda were transportation reorganization in general, the reorganization of transportation regulatory agencies, and highway safety reorganization. Also includes a memo from the White House Science and Technology adviser on the highway safety proposal. April 29, 1970 confidential memo from White House aide Ed Harper to President Nixon's domestic policy czar, John Ehrlichman, suggesting that the President impound (hold back from availability) even more highway contract authority from the Highway Trust Fund. The aim was to cause the Highway Trust Fund's unspent balances to build up so that they could build support for opening up the Trust Fund to spending on non-highway programs like mass transit. This is a series of memos presented to President Ford in May 1975 requesting his decisions on highway funding policy for fiscal 1976 and thereafter. The main issue was that the newly created Congressional budget process had ended the practice of executive branch "impoundment" of money (including highway contract authority), which was causing a huge increase in the amount of highway contract authority available to states for obligation. October 22, 1965 memo from Under Secretary of Commerce for Transportation Alan Boyd to White House domestic policy chief Joseph Califano, Jr. The memo transmits two papers dealing with transportation organization that Califano had requested at a September 25 meeting - a 19-page paper recommending which existing agencies and programs should and should not be included in a new Department of Transportation, and a 12-page paper examining a proposal to consolidate the existing transportation regulatory agencies (the Interstate Commerce Commission, Civil Aeronautics Board, and Federal Maritime Commission) into one transportation economic regulatory authority. September 22, 1965 decision memo for President Johnson from Joseph Califano asking Johnson's approval to order the Commerce Department to prepare plans for the creation of a Department of Transportation, a reorganization of transportation regulatory functions, a program of transportation rate reform, and a major highway safety program for the FY 1967 (calendar year 1966) legislative agenda. 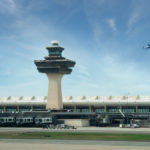 Partial legislative history of the Airport and Airway Development Act of 1970 - Part I consists of proposals on this topic made by the Johnson Administration in 1967 and 1968. The issue of whether the government should pay for transportation through general revenues or through some kind of charges on the users of the transportation system goes back a long way. In 1965, the Johnson White House attempted to move the conversation forward by proposing to increase user charges on aviation, levy new user charges on inland waterway transportation, and increase and extend the user charges on highway transportation, all of which were excise taxes. These White House memos from 1964 and 1964 summarize and justify those user charge proposals. November 16, 1978 memo to President Carter asking him to settle a disagreement between DOT, OMB, and the White House Domestic Policy Staff on whether or not to insist on building the originally-envisioned 101-mile DC Metrorail system or to support truncation of less cost-effective extensions. Includes previous memos of August 15, 1978 from Transportation Secretary Brock Adams and of August 15, 1978 and November 22, 1978 from the Domestic Policy Staff. Includes President Carter's handwritten notes and checkoffs of decision boxes. Memo presented to President Carter on November 5, 1978 expressing the views of Administration agencies on the enrolled bill H.R. 11733, the Surface Transportation Assistance Act of 1978. Fifty years ago today, Under Secretary of Commerce for Transportation Alan Boyd sent a letter to President Johnson’s domestic policy advisor, Joseph Califano, transmitting the first round of working papers prepared by the interagency Task Force on Transportation Legislation. August 1965 White House legislative strategy memos relating to highway beautification legislation. August 1965 memoranda from White House advisor Bill Moyers relating to meetings “to identify and lay plans for the careful development and review of potential legislative proposals to the second session of the 89th Congress in the field of transportation." April 1955 opposition research memo from the Democratic National Committee criticizing the "Clay Commission" Interstate highway plan submitted by President Eisenhower. June 30, 1965 resignation letter from FAA Administrator Najeeb Halaby to President Johnson where Halaby recommends the creation of a new Department of Transportation to include the FAA. Analysis of the provision in Magna Carta preventing the Crown from forcing local landowners to build bridges across navigable waterways. A series of three late November 1982 memos from DOT and OMB trying to refute the arguments that each agency made to President Reagan in the final Cabinet meetings to determine whether or not the President would request a gasoline tax increase. A June 1961 memo to President Kennedy from the head of the Housing and Home Finance Agency transmitting the draft legislation to give permission for two or more states to establish joint planning organizations for urban areas, to ensure that federal housing planning grants could be used for transportation planning, and to provide the first federal demonstration grants for mass transit. A January 1923 memo to the U.K. Cabinet by the Financial Secretary to the Treasury questioning the wisdom of the Road Fund (created in 1909 with a dedicated revenue stream from motor vehicle taxes) and the propriety of dedicating specific excise taxes to specific spending programs. Briefing papers given to President Carter in anticipation of his December 11, 1978 meeting with Transportation Secretary Brock Adams where the two would decide on a general strategy for pursuit of trucking and rail deregulation in the upcoming Congress. Briefing papers prepared for President Ford in advance of an April 1975 meeting to discuss what kind of freight railroad rescue package to request from Congress. The legislation eventually became the Railroad Revitalization and Regulatory Reform (4R) Act of 1976 (Public Law 94-210). February 1993 memo to President Clinton from his chief economic adviser giving the pros and cons of various types of new energy taxation. 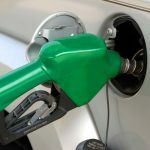 The memo framed the decision to request a BTU tax, which was changed by Congress to a 4.3 cent per gallon gasoline and diesel tax. Oral history given by former OMB Deputy Director Charles Zwick, who played an integral role in the creation of the Department of Transportation. Internal White House summary of a proposed "New Federalism" initiative for President Reagan, dated January 1982, which would have turned back significant highway and mass transit spending (and their dedicated excise tax revenues) back to states. President Carter's March 1977 handwritten note to new Transportation Secretary Brock Adams explaining why the President thought most new subway systems were a bad idea. A memo to President Kennedy from his senior advisor Ted Sorensen written on March 16, 1962, as the Administration was working on the text of the transportation message to Congress that the President would submit on April 5 of that year. This week’s ETW Document of the Week is a Carter Administration memo preparing the President for a meeting with the chairmen of the House and Senate transportation committees, Rep. Harold “Bizz” Johnson (D-CA) and Sen. Howard Cannon (D-NV), and with House Aviation Subcommittee chairman Glenn Anderson (D-CA). The memo to Carter makes it clear that the chairmen were holding airline deregulation hostage in order to get Carter’s support for an unrelated airline noise bill. 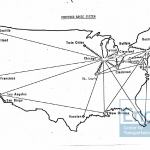 This week’s ETW Document of the Week is an exchange of memoranda from late 1970 and early 1971 between the Nixon White House, the Office of Management and Budget, and the Department of Transportation over what routes the newly formed National Rail Passenger Corporation should serve. This week’s ETW Document of the Week is a letter sent from Rex Whitton, the head of the American Association of State Highway Officials, to the chairman of the U.S. Senate Finance Committee, Harry F. Byrd, and other Senators in May 1956 expressing the candid views of the state DOTs on the Interstate Highway Act that had just been passed by the House of Representatives. 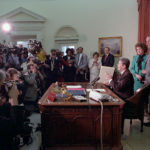 Few budget amendments have been broader in their scope than the ones submitted by Ronald Reagan in March and April 1981 for the fiscal year 1982 budget. Of particular note are the proposed aviation excise tax reforms mentioned in the document, which prove that from the outset President Reagan was not averse to increasing some kinds of excise taxes if they were dedicated to a trust fund whose programs benefit the taxpayers and if the tax increases, "would eliminate general fund subsidy of the costs put on the system." Wednesday, January 28, is the 100th anniversary of President Wilson's signing of the law that created the Coast Guard. The Coast Guard Act combined two existing services: the Revenue Cutter Service (founded 1797, basically tax collectors with boats and guns to make sure shippers weren't avoiding tariffs by docking boats and unloading cargo outside designated Customs ports of entry), and the Life-Saving Service (established in 1878 to aid survivors of shipwrecks). On January 21, 1915, the Congressional Joint Committee on Federal Aid in the Construction of Post Roads issued its final report to Congress. The report of the Joint Committee represented, by far, the largest assemblage of information regarding roads ever published in the United States. "Federal policies usually make a lot more sense when you look back and see how they have evolved over time."